EDITOR'S NOTE - This is the final installment of a three-part series with Angelo. We thank him for his extra effort on such a sensitive topic. Angelo, thank you for all of your efforts in this. I know it's not easy. Before we begin to close out the final part, I'd like to hear your thoughts on the last weeks documenting her life. There was so much going on those last weeks. When I think back about those days I still can’t believe they happened. I was taking care of Jen, keeping family and friends up to date, and trying not to lose it. I knew what was coming but all I wanted was for Jen to be comfortable. As I’ve mentioned in earlier comments, I wasn’t really thinking too much about what I was photographing, i.e. get this shot or that shot. I’ve started to understand why I turned to the camera during this time and it was the only thing that made any kind of sense in my life. It was an escape for sure. I’ve always thought the world was a safer place when I looked at it through my camera. Maybe it was desperation, like I was holding on to anything I could while I was watching Jen die. One thing that was beautiful is that so many family and friends came over to see Jen. I have photographs of all of these loved ones with Jen and you can feel the love they are sharing. I remember these moments and the love from those last days but these photographs bring me back when my mind starts to wander. What was different about this stage than earlier in your documentation? I knew Jen was going to die at this point. Sooner rather than later. Everything in my life was pointing to that moment and I couldn’t stop it from happening. I think I was desperate and my mind was a mess, while at the same time I was so hyper-focused on Jennifer and anything she might need. What were some of your feelings at this stage, and how did the work impact you emotionally? I didn’t want to sleep because I didn’t know if Jen was going to wake up again. Hell, I didn’t even want to shower because I didn’t want to be away from Jen at all. Any minute was going to be our last together. I’ve never felt so exhausted. It was all so unreal. I remember realizing that each photograph I made could be the last. 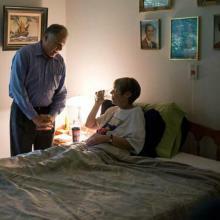 In the final days, what was it like for you to document? I can imagine that being a terrible, incredibly difficult to do and experience. 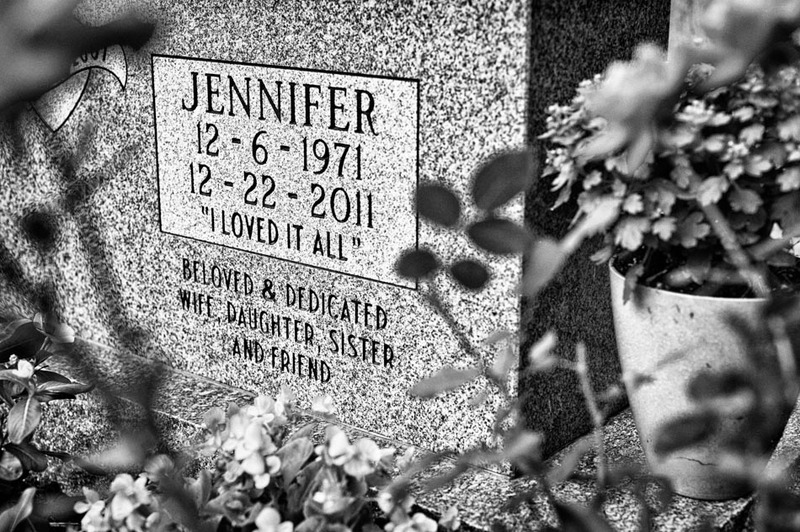 The feeling that each photograph could be the last one I made of Jennifer while she was alive was beyond sobering. It brought everything together: that this was real and that Jennifer was dying. I knew this was the case but I think making photographs during Jen’s illness was a way of hiding and now my shield was being taken away. Jen was more than my wife, she was my best friend and my biggest supporter. I always felt I could achieve anything I wanted to as long as Jen was with me. I was still trying to make Jen smile. A lot of the photographs from this time are of Jen with family and friends. As I looked through the camera I couldn’t help but to think of how many people Jen touched in her life and the impact she had on so many of us. There's a picture you have driving behind her hearse. Can you talk about what you were going through in this moment in time? We were following the hearse to the cemetery, I was in the car with one of my brothers and my parents. It had started snowing during the funeral. I kept thinking, “Why am I in this car and not in there with Jen.” I couldn’t believe she was in a casket in a hearse. It was also weird to be in that first car as the funeral procession passed through town. We were coming to a bridge and I felt so empty. As I looked around I saw the trees with no leaves and life was just desolate. 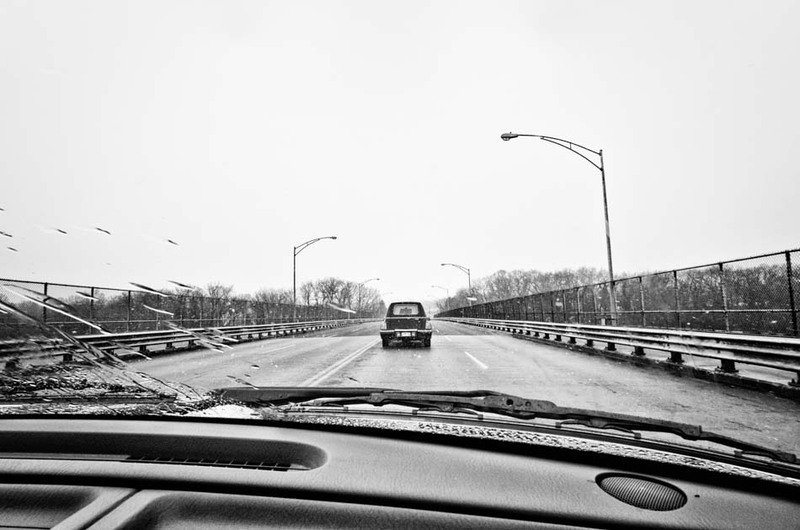 There were no cars at that moment and the bridge was symbolic of many things - Jen’s path, my path…This photograph hits me hard. I couldn’t hide anymore. You mentioned in a previous email exchange that you had challenges as a husband, widower moving forward with this body of work. What do you mean by this? In a way I’ve been obsessed with these photographs since Jen died. People have asked if I’ve trapped myself in this memory by working on our story. I’ve looked at it as my way of facing what Jen and I experienced. I don’t understand it yet and probably never will. But these photographs have forced me to accept what has happened and to try to put my life back together. That said, there are times when I’ve had to walk away. It is still too much. I can’t believe Jen died. Life is so different for me now, my thoughts, feelings, ideas…Nothing is the same. I just knew that these photographs would be a bridge back to this time and a way for me to find some peace. I’ve come to accept my own mortality. I’m still afraid of death and want to live but in accepting what I cannot avoid I have embraced the fact that I am alive and healthy. You also mentioned there have been positive and negative reactions to your images. Can you tell us examples of both and how they impacted you? 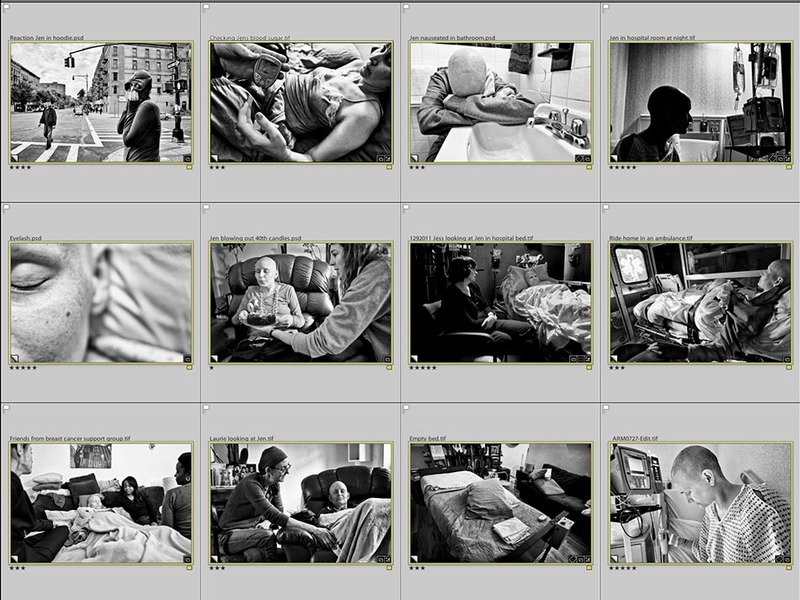 I get it to some degree, these photographs are emotional and they trigger many feelings. 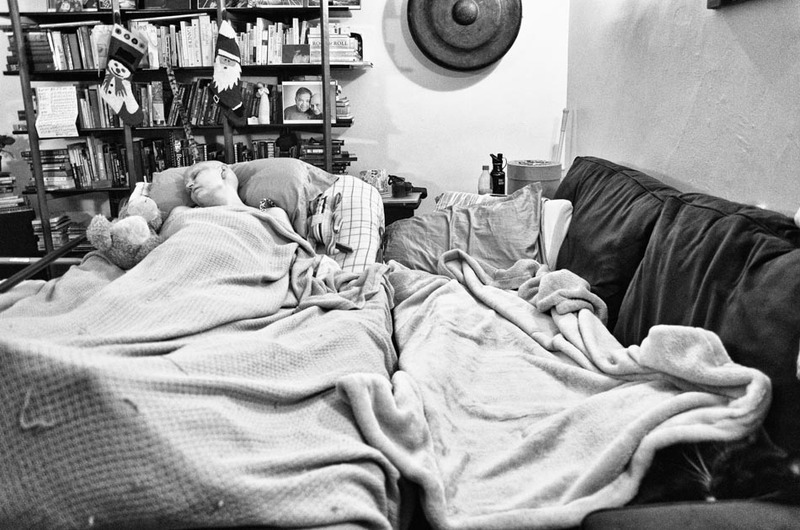 I’ve been accused of getting rich off of my dead wife, of using these photographs to get more women in bed, of promoting that "Women are never good enough as we are, no matter what we do.” All kinds of things that are so far from the truth. Granted, there is much more positive coming from this than negative, but it is still hard to be accused of things like this by people who have never even had a conversation with me or Jen. I know that by putting our story out to the public I have to be open to this. It stings though. I’m getting better at brushing these comments off. Women have contacted me to share that they are getting a mammogram because of our story. 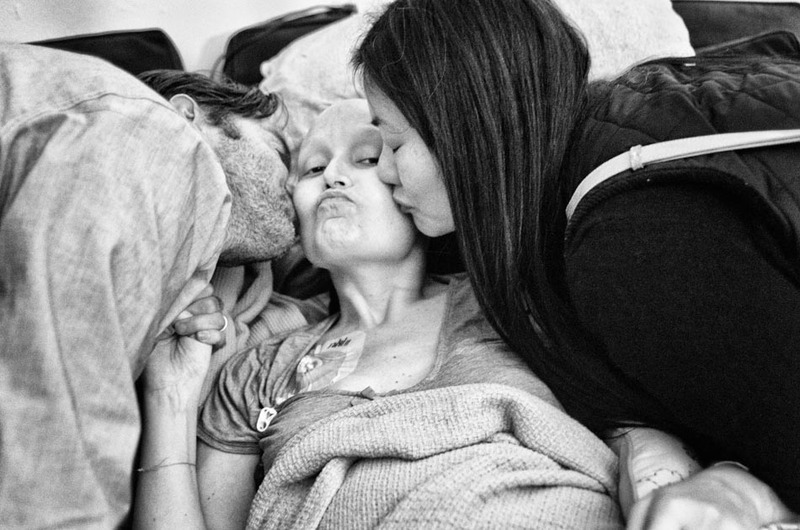 Women with breast cancer have shared that they feel less alone because of these photographs. Jen’s legacy is making a positive impact in the world and this helps me to get out of bed in the morning. If I don’t make something positive out of all of this then Jen just died, and for what? I believe we should share our experiences because if we don’t, how will we grow and learn? How has this process helped you heal? For the last 2 years I’ve been looking at these photographs; I’ve spent many hours thinking about Jen and our life together. I know there is a lot more healing, really I don’t think I’ll ever “heal,” but I do my best each day to keep moving forward. Life feels slightly off now. It’s hard to put it into words but it’s like constantly feeling dizzy. My thoughts are different, both the actual thought and the process of thinking. Seeing our story spread and hearing how Jen’s legacy is making a positive impact on the world helps me because something good is coming from Jen’s death. If not, then she would have just passed. I admired Jen and the last thing I want is for people to forget her. So I guess these photographs have helped me to keep Jen alive in one way while also accepting that she has passed. Moving forward, what do you hope to accomplish with your work? A friend recently shared her feelings about what it means to be an artist, which is a word I’ve always shied away from. This friend feels that being an artist is just sharing her interpretation of the world and the things that are important to her. I don’t claim to have the answers or to know the right way to do anything. I do know that when something hits me as beautiful or important I instantly reach for my camera. I hope my photographs will make people think. It doesn’t have to be an earth shattering thought, maybe it’s just a minute to take a deep breath. As we move to close, what thoughts would you like to share about your wife? What should people know about her that most people don't? Jen had a way of making you feel like you were the only person who mattered. She listened and cared about people. About a week before Jen passed several friends stopped by to see us. After everyone had left I asked Jen how she touched so many people. Without hesitation Jen said, “Because they touched me.” Jen really cared and went out of her way, without expecting anything in return, to help others. She had the biggest heart of anyone I have ever known. I want to be a better person because of the way Jen lived her life. 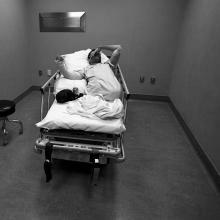 Angelo Merendino's photo-documentary, The Battle We Didn’t Choose – My Wife’s Fight With Breast Cancer, has received worldwide recognition. 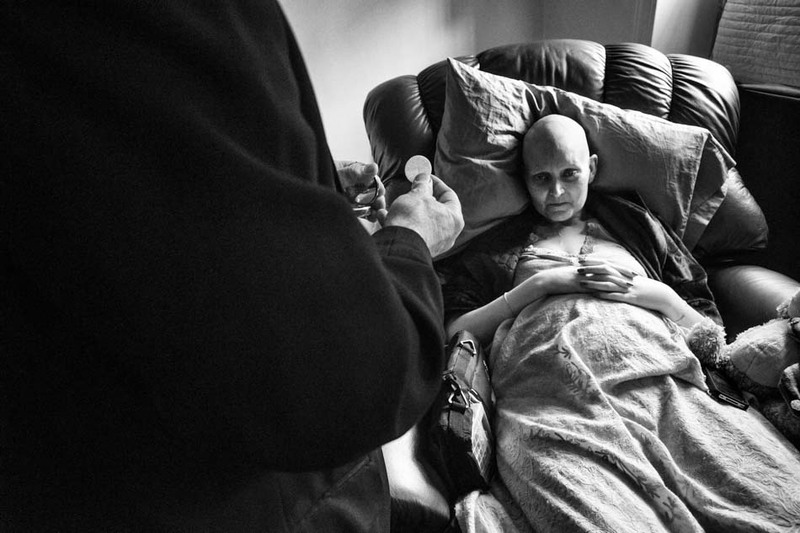 Intimate, honest, and moving, Angelo’s photographs offer viewers a look inside the day-to-day life of a young couple facing breast cancer together. More than a story about loss, this is a story about love and life. Based in Cleveland, Ohio, Angelo does freelance work for both Corbis News and Getty Images. Angelo’s photographs have been exhibited in New York City, Washington, D.C. and Rome, Italy. Online features have appeared on The New Yorker Photo Booth, The Huffington Post and The Guardian. Printed press includes The New York Times, The USA Today and Polka. In December of 2013 three of Angelo's photographs were added to the permanent collection of The Akron Art Museum.